Install a new ink cartridge for your printer. 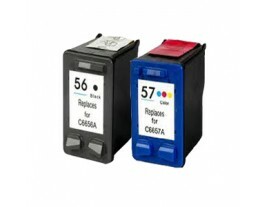 The HP 56 and 57 Ink Cartridges package contains two ink cartridges - one color and one black. There are several HP printers compatible with the 56 (C6656AE) black and 57 (C6657AE) tri-colour ink cartridge including Photosmart, PSC, Officejet, and Deskjet. The black HP 56 ink cartridge contains 20 ml of ink, and the colour HP 57 ink cartridge contains 18 ml. They are both bundled together in a convenient package that saves money. The colour cartridge includes cyan, magenta, and yellow ink. You will be able to create colorful pages that feature beautiful pictures and vivid text. Each cartridge is well designed and easy to install. These cartridges last for years and have enough ink to print hundreds of pages.